HEK293 cells were transfected with vectors encoding HA-SIK1, HA-SIK2 or HA-SIK3 wildtype (WT) or carrying an alanine mutation at the T-loop site. Cell extracts were then blotted using the anti-SIK1 phospho Thr 175 antibody S405D. 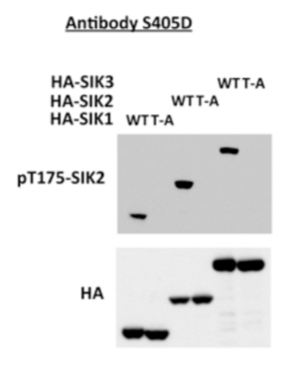 Detected very strongly SIK1, SIk2 and SIK3 wildytype in extracts of HEK293 cells overexpressing wildtype HA-SIK1, HA-SIK2 or HA-SIK3, but not the protein carrying a mutation at the T-loop site.